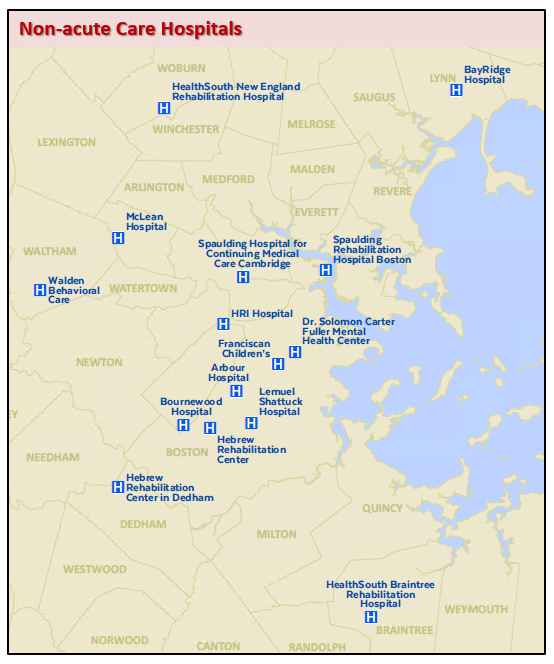 This point data layer shows the location of 45 non-acute care hospitals in Massachusetts. 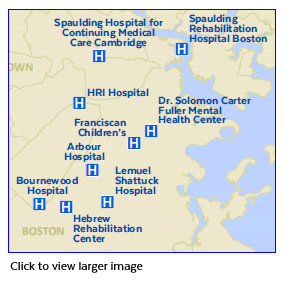 Non-acute hospitals in Massachusetts are typically identified as psychiatric, rehabilitation, and chronic care facilities, along with some non-acute specialty hospitals, using the Massachusetts Department of Public Health (DPH) and Department of Mental Health (DMH) license criteria as well as a listing on the state's Bureau of Hospitals website. The hospitals in this layer do not contain 24/7 emergency departments; for those facilities see the Acute Care Hospitals (HOSPITALS_PT) layer. The features in this layer are based on database information provided by the DPH and the Center for Health Information and Analysis (CHIA). CHIA reviewed this layer in November 2018. The layer is named HOSPITALS_NONACUTE_PT. See CHIA's Massachusetts Non-Acute Hospital Profiles page for more information. MassGIS received database files from MDPH and CHIA and geocoded them to point features in the Master Address Data. Points were also geocoded for the Bureau of Hospitals locations. MassGIS consulted some facilities' websites for additional information. CHIA reviewed the final revision in November 2018. Chronic Care Hospitals are hospitals with an average length of patient stay greater than 25 days. These hospitals typically provide longer-term care, such as ventilator dependent care. Medicare classifies chronic hospitals as Long-Term Care Hospitals, using the same 25-day threshold. Psychiatric Hospitals are licensed by DMH for psychiatric services and by DPH for substance abuse services. Rehabilitation Hospitals provide intensive post-acute rehabilitation services, such as physical, occupational, and speech therapy services. For Medicare payment purposes, the federal government classifies hospitals as rehabilitation hospitals if they provide more than 60% of their inpatient services to patients with one or more of 13 diagnoses listed in federal regulations. Specialty Hospitals provide unique sets of services and serve unique patient populations. Specialty hospitals are not considered a cohort for comparison and analysis by CHIA but may be included in statewide analyses. State Multi-Specialty Hospitals provide acute and chronic hospital medical care to individuals for whom community facilities are not available or access to health care is restricted. These facilities are owned and operated by the Commonwealth of Massachusetts and are not listed in CHIA's non-acute hospital profiles. MassGIS maintains this datalayer and will make updates as needed with input from Mass. DPH and CHIA. Note that Bridgewater State Hospital is part of the Prisons layer and not this layer because in all cases, the patients that are admitted to this facility may be charged with or convicted of crimes ranging from misdemeanors to major felonies.